Carlos Guitz (center) died on December 13, 2017. In this picture he is surrounded by his brother Rolando and his sister Blanca, who were both arrested in April of 2017 on false charges and spent a week in jail for their organizing in defense of indigenous rights and the ecosystems of the Dolores river. Peasant leader Carlos Isaias Guitz Pop died on December 13, leaving us at the GSP and many others whose lives he touched with heavy hearts. Guitz was murdered because of his involvement in the struggle to recuperate indigenous lands. The GSP is demanding the immediate arrest of David Leonel Ponce Ramirez and Augusto Sandino Ponce for his murder. Family members of Guitz have attempted to file complaints but the police have refused to receive them. We request that allies also write letters calling for their arrest (see bottom of this alert). On November 8, 2013, Guitz was shot in the back and left paralyzed. He struggled valiantly for four years to regain his health, but his body was not as strong as his spirit and finally he passed away earlier this month due to complications from the injury. David Leonel Ponce Ramirez and his son Augusto Sandino Ponce are wealthy “land owners” whose private army shot Guitz as part of an effort to steal indigenous land and sell it for the construction of the Santa Rita hydroelectric dam in the department of Alta Verapaz. As the US continues to support a form of “development” based on insatiable consumption, there is a growing need for energy production. Indigenous territories in Guatemala have become an increasing target because of their enormous water resources and the fact that indigenous people have never been considered fully human by the US government. Foreign capital is building a rapidly expanding infrastructure of hydroelectric dams and an international electric grid that is destroying ecosystems and displacing indigenous peoples. In 2008, the Guatemalan government awarded a license to a private company to build a dam on the Dolores river despite the fact that dozens of indigenous communities would be flooded by the approved dam. In 2010, 20 communities held official assemblies declaring their opposition to the project. 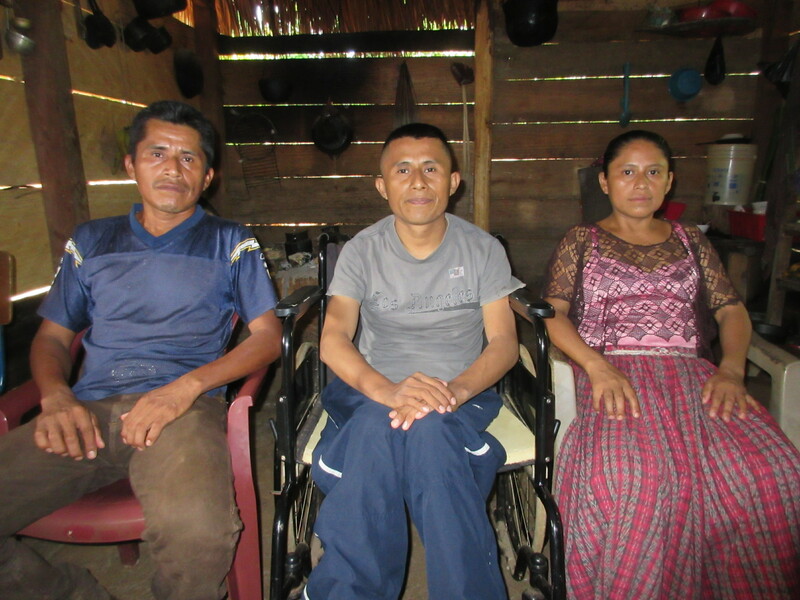 Carlos Guitz helped his home community of Monte Olivo organize one of the assemblies. Instead of recognizing the basic rights of these communities, the Guatemalan government chose to take extreme measures. Leading Guatemalan military officials are trained by the US Army School of the Americas (soaw.org), where the US military instructs foreign soldiers on how to terrorize civilian populations and steal land on behalf of corporations. On March 22, 2012, soldiers invaded Monte Olivo without warning and set up a military base to coordinate repression against the organized indigenous communities and to support the construction of the dam. The military was not prepared for the high level of discipline of Carlos Guitz and other community leaders, who refused to be silenced in the face of terror. The communities coordinated numerous forms of protests and marches at the local, national and international level, in some cases marching hundreds of kilometers to raise awareness of their struggle. In the face of intense pressure, the military closed the base after just one month and pulled out of the community. Dam construction was halted, preventing for now the potential flooding of the communities or the destruction of local ecosystems. Unfortunately the victory is not complete and the government has only deepened the repression. In 2013, dozens of arrest warrants with fraudulent charges were filed against community leaders. That same year the community of Monte Olivo faced numerous violent attacks. On August 14, leading environmental activist David Chen survived an assassination attempt. On August 23, while community members met with United Nations representatives about the repression, hydroelectric company employees attacked the community and murdered two children. Then on November 8, 2013, dozens of homes were burned down, and Carlos Guitz was shot in the back. Guitz was immediately left paralyzed from the waist down. He was taken to the hospital, but when hydroelectric company employees showed up looking for him he was moved to a remote location to recuperate in hiding. He was later moved to Guatemala City because of the extent of his injuries, and eventually he was brought home. While he had good days at home and was hopeful that he would recover, he would never regain use of his legs and his kidneys never fully functioned due to the damage done by the bullet, causing chronic infections in his lungs and other areas, leading to his death. From the day that Guitz was shot until today, the communities defending the Dolores river have continued to face repression. This has included constant threats, assassination attempts, arrests of community leaders and armed attacks. One of the worst attacks occurred in August of 2014, when over 1,500 soldiers and paramilitaries attacked several indigenous communities in the region, burning down dozens of homes, killing three community leaders and injuring many others. Monte Olivo community leader Thomas Chen was beaten unconscious and arrested. This repression has not been enough to displace the communities involved in this struggle. Carlos Guitz is no longer alive, but his memory lives in the hearts and minds of those he organized with. This memory will continue to support the struggle, and his story will be used in defense of the rights of indigenous peoples in Guatemala. We ask you to take an action below so that Guitz will continue to support the recuperation of Mother Earth even after his death. I am contacting you to call for the immediate arrest of David Leonel Ponce Ramirez and Augusto Sandino Ponce for the murder of Carlos Isaias Guitz Pop. Guitz was shot on November 8, 2013 and died from his injuries on December 13, 2017. His family attempted to file a complaint with the police after Guitz was shot, but the police refused to accept the complaint. It is important that the Guatemalan government value all lives, including the lives of indigenous people. Please contact the appropriate authorities and ask that they respect the lives of indigenous people and immediately arrest David Leonel Ponce Ramirez and Augusto Sandino Ponce for the murder of Carlos Isaias Guitz Pop. 2) Donate to the GSP. All donations go to our partners. Donations are tax-deductible in the US. There is an URGENT for us to help our partners mobilize in the face of violent repression and large scale land theft. Please consider making a donation of any size via our website or write a check to “UPAVIM Community Development Foundation” and mail to UPAVIM, PO Box 63, Marshfield, VT 05658. We thank our fiscal sponsor UPAVIM Community Development Foundation for helping us ensure that your contributions are tax deductible and that all funds (other than bank transaction fees) go to our partners in Guatemala. 4) Join our urgent action email list to receive updates and participate in ongoing actions. To join our urgent action list email info@guatemalasolidarityproject.org with “Add to urgent action list” in the subject line, and we will let you know of important actions to take immediately after emergencies such as the arrest of a community leader or an attack on a community.